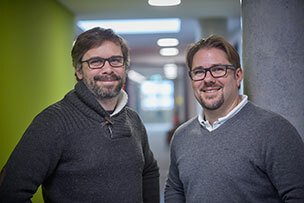 The warehouse management specialists at Dr. Thomas + Partner have a brand new passive house campus facility to their name. An extraordinarily energetic structure, the new TUP campus houses a modern working environment. 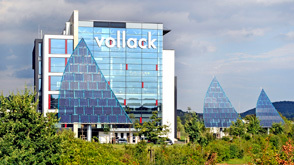 For the first time, Vollack installed a seasonal latent heat storage system, an intelligent storage medium that utilizes ice to provide heating and cooling and makes the building nearly energy self-sufficient. The campus’s design has made it a reference project for passive construction, drawing experts from around the world. The facility’s 3,600 square meters of usable space feature exposed concrete walls with seamlessly integrated wooden windows and green acoustic module accents. The campus’s individual offices are split into functional cubical areas for archiving, engineering, and service-related activities, and the cafeteria at the heart of the building provides a welcoming space for employees to come together.